The Northwest Region sponsors three conferences (Spring and Fall), holds executive committee meetings, and recognizes "Northwest Region Book Grant" and "Northwest Region Outstanding board District Participation" in addition to OSBA recognitions. Twenty counties comprise the Ohio School Boards Association Northwest Region: Allen, Auglaize, Defiance, Erie, Fulton, Hancock, Hardin, Henry, Huron, Lucas, Mercer, Ottawa, Paulding, Putnam, Sandusky, Seneca, Van Wert, Williams, Wood and Wyandot. This award recognizes individuals and groups who actively engage in exceptional efforts to improve the welfare of others through their altruistic activities. The award altruistic efforts both in the schools and community. The purpose is to recognize those demonstrating the ethics of kindness, benevolence, and sympathy in their schools and communities. These individuals have a sincere concern for those around them and go above and beyond the call of duty. This award is peer nominated and is awarded twice per year at the Northwest Region's Spring and Fall Conferences. Click here for the nomination form. Application deadline is Jan. 31, 2019. This is an award for organizational leadership. This award is special because it recognizes that leadership occurs at ALL levels of the organization - from the playground to the central office. The Who's Who award is reserved for those who demonstrate exceptional leadership for the betterment of the district. The nominees for this award are generated by those who work with and around them and is awarded twice per year at the Northwest Region's Spring and Fall Conferences. Click here for the nomination form. Application deadline is Jan. 31, 2019. The award rewards school district members and organizations engaged in activities to support and enhance their school and community. The Northwest Region has extraordinary board members, students, teachers, administrators, and community members engaged in noble and selfless community volunteerism. This award honors donated service or activities that are performed by someone or a group of people for the benefit of the public or its institutions demonstrating a deliberate connection between the community and educational development and social goals. This award is peer nominated and is awarded twice per year at the Northwest Region's Spring and Fall Conferences. Click here for the nomination form. Application deadline is Jan. 31, 2019. While the Northwest Region Award Selection Committee will select the winner, all nominees will be recognized. The Book Grants are presented to high school seniors in Northwest Ohio whose school district is a member of OSBA. The Northwest Region of OSBA is committed to inspiring and encouraging teacher candidates in Ohio. The award has been made possible by board members active in the Region. Click here to download the application form. Application deadline is January 2019. 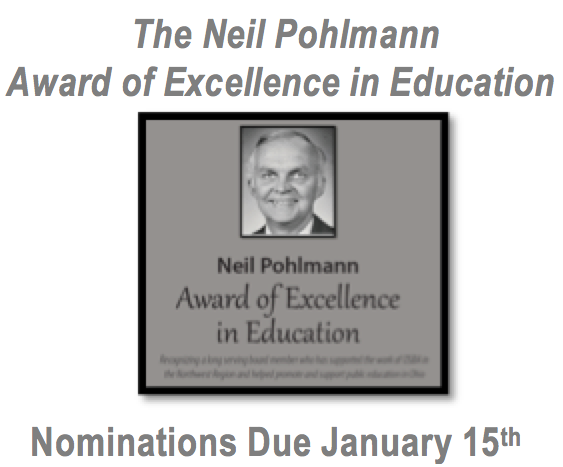 As a long-standing Northwest Region OSBA Secretary/Manager and Professor in the Educational Administration and Supervision (EDAS) Program at Bowling Green State University, Dr. Neil Pohlmann was a strong and respected advocate of public education and demonstrated significant impact on the lives of superintendents, principals, students and countless other educators in the Northwest Region of Ohio. This award is presented to a long-serving board member who has supported the work of the OSBA Northwest Region and helped to promote and support public education in Ohio. Click here for the nomination form. Application deadline is Jan. 31, 2019.